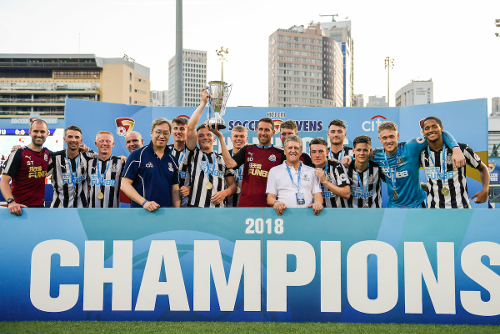 Newcastle have entered a team in the annual two-day football event in Hong Kong since 2012 (aside from 2016). Played on artificial pitches at the Happy Valley home of Hong Kong FC, group stage games are seven minutes each way with a one minute break - with knockout games increasing to ten minutes each way and a three minute break. Squad: Owen Bailey, Dan Barlaser, Tyrique Bartlett, Lewis Cass, Luke Charman, Victor Fernandez, Nathan Harker, Matty Longstaff, Callum Roberts, Kelland Watts. Squad: Dan Barlaser, Luke Charman, Ben Smith, Liam Gibson, Jamie Holmes, Jack Hunter, Sean Longstaff, Michael Newberry, Dan Ward, Callum Williams. Squad: Dan Barlaser, Adam Bartlett*, Macaulay Gillesphey, Alex Gilliead, Tom Heardman, Jack Hunter, Adam Laidler, Callum Roberts, Liam Smith, Jamie Sterry, Callum Williams. (*Paul Woolston dropped out of the squad due to injury and had to be replaced by Academy coach and former youth team 'keeper Bartlett). Squad: Rolando Aarons, Jak Alnwick, Dan Barlaser, Macaulay Gillesphey, Alex Gilliead, Adam Laidler, Ryan McKinnon, Greg Olley, Jonathyn Quinn, Callum Williams. Squad: Rolando Aarons, Jak Alnwick, Sammy Ameobi, Paul Dummett, Brad Inman, Steven Logan, Conor Newton, Michael Richardson, Remi Streete James Tavernier. Squad: Jak Alnwick, Adam Campbell, Paul Dummett, JJ Hooper, Brad Inman, Steven Logan, Brandon Miele, Marcus Maddison, Lubo Satka, James Tavernier.